Wood need to be properly processed before can be used for making log houses. Manufacturers would initially remove the bark and use the inner part of the wood. Under the bark there’s a cambium layer and it’s where nutrients and water flowed when the tree was still alive. Water could flow between the root and the tip of the leaves. Fungus, mold and bugs require a habitat where water is found. By removing the bark, manufacturers are able to eliminate cracks and crevices where fungus, mold and bugs could live more easily. There are different ways how logs can be handled. After the bark is removed, the manufacturer would remove much of the moisture and treat the wood to prevent future growth of microorganisms. 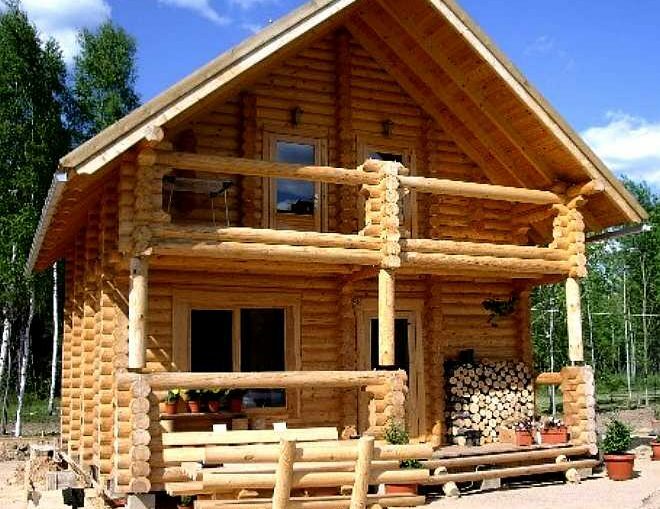 In general, log houses are often made with completely kiln-dried logs that may have been fumigated to eradicate germinating spores and hatching eggs. However, one another extreme, some log home manufacturers insist on using green logs that are usually wetter and less treated. During a green process, logs may only be air-dried under the sunlight, but the water content would still be higher than kiln-dried wood. Problems could occur when kiln-dried wood is stacked for future usages. When the condition is humid enough, the wood could actually re-absorb moisture, even when it is fully covered inside a closed storage shed. Some organisms may also start to creep their way into these stacked woods. The kiln can help to speed up the overall drying process, manufacturers should look for ways to prevent any re-absorption. A typical log house could nearly 3 tons of excess water inside logs when the wood is not properly dried. This could cause microorganisms to proliferate much more easily. It should be known that green logs can be heavier, making the construction process slower. In a place with drier climate, green logs could eventually lose moisture, causing problems in the future. It means that logs could shrink and an entire wall may settle. This could destabilize the entire construction, due to settling and shrinkage. Using green logs for our house may require additional maintenance tasks in the future. The house would also need to be regularly checked for possible changes. Cracks may happen and holes could start to appear. Gaps could start to be visible on top of the windows and doors can’t be closed or opened properly. So, before building a log house, it is important for us to know that the wood is properly dried, especially if we are living in a country with relatively lower humidity year around. Wet or green wood isn’t appropriate in some cases, so it’s important for us to fix them.